Stylish, durable and very comfortable to handle, the water-saving Eurosmart Cosmopolitan kitchen tap is designed to make cooking and cleaning a pleasure. As a single-lever tap it’s easy to operate and has a cutting edge GROHE SilkMove ceramic cartridge so you can control water temperature and flow with smooth precision. With integrated GROHE EcoJoy technology it also cuts water consumption by up to 50 per cent without a single drop in performance! The scratch resistant chrome coating is easy to clean and has a sparkle that will last for years. 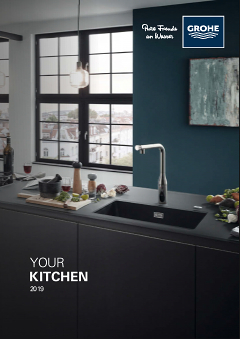 The Eurosmart Cosmopolitan kitchen tap – blending style and quality for your kitchen convenience.